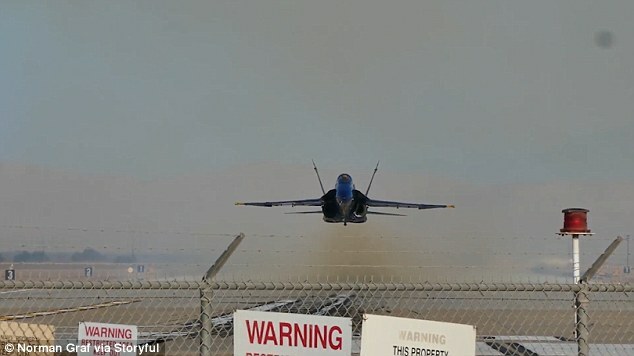 This is the spectacular moment a fighter jet pilot left onlookers in a whirlwind of dust as his plane roared off the runway. The US Navy F-18 Hornet from the Blue Angels display team created the spectacular cloud as the pilot performed a ‘low transition takeoff’. One plane spotter even ducks in the video because the jet is flying so low. 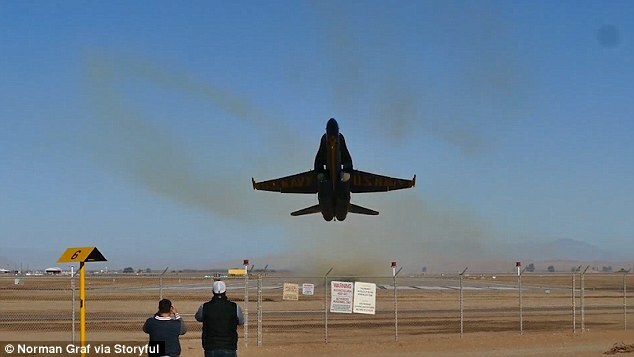 Lieutenant Brandon Hempler from the Blue Angels was preparing for an upcoming airshow season when he gave spectators a taste of what was in store. Hempler demonstrated a low transition takeoff directly over their heads much to the pleasure of the enthusiastic onlookers. In performing the low transition take off, Lieutenant Hempler rapidly manoeuvred the jet from horizontal to vertical using the engines powerful thrusters – rather than gradually building altitude like conventional take offs.